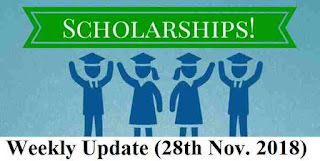 Here comes with the weekly updates with the Scholarship opportunities for eligible candidates of India. Every week on Wednesday we shared the various Scholarship opportunity opening in various sector. This week (28th Nov. 2018) update is out. Check the complete post carefully for full detail. Girl students, who are in their first year of post-graduation, are extended economic assistance by University Grants Commission, to help make their higher education dream possible. Eligibility: Applicant should be the only girl child or twin daughters in their family. The applicant must be pursuing regular full time post-graduation and should not be aged over 30. Details: Selected students will be receiving an amount of ~36,200 for a period of two years or until the completion of their post-graduation course. Undergraduates and postgraduates of medical sciences and healthcare streams are invited to apply for this scholarship offered by TATA Trusts for the current academic year to support themselves in their higher education. The scholarship is open for students from myriad wings of medicine. Eligibility: The applying candidate can be a bachelor degree student who has cleared the first year of the programme or a student currently pursuing a master degree. To be considered eligible, the applicant must meet the minimum score as mandated, in the programme undertaken. 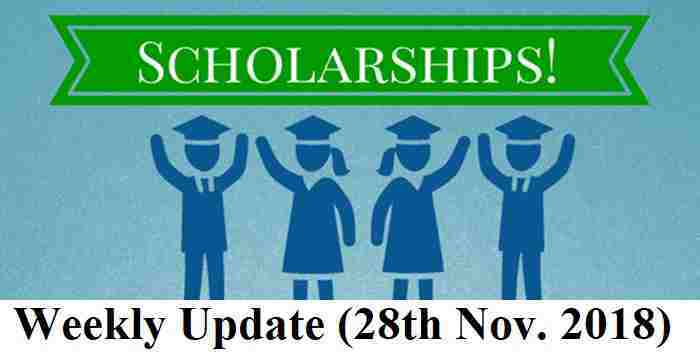 Details: The scholarship award can be supported ranging from 30 to 80 per cent of the total fees paid to the college or institutes. UK-based Bath Spa University is calling out to meritorious students, looking forward to pursuing postgraduation degree programme in Business Management. Eligibility: The applicant must be a graduate with 55 per cent or more and must have obtained 70 per cent in the English subject in Class 12 or has 6.0 band in IELTS. Details: Scholarship worth GBP 1000 will be awarded to the selected scholar. Students willing to undertake research for PhD or integrated PhD degree in mathematics are offered this scholarship by the National Board of Higher Mathematics, Department of Atomic Energy, Government of India, to benefit them with the research assistance provided under this call for a period of four years. Eligibility: Final year students or those who have completed master’s degree in pure or applied mathematics or statistics (MA, MSc. or equivalent); holding four year BS or equivalent degree and have secured a seat in a recognised PhD programme on or before August 1, 2019, are eligible to apply for this call. Details: Selected candidates will be granted ~25,000 per month for first and second year and ~ 28,000 for succeeding years. In addition to, an annual contingency grant of ~32,000 and house rent allowance. How to apply: Applications can be sent via email or speed post. Disclaimer: We took this information from The Tribune Newspaper published on 28th Nov. 2018. All rights of Above information goes to The Tribune News PAPER.